So, Instagram has stolen Vine’s thunder and released a new version that includes video. With some nice additions to that of Vine, such as (of course) filters, the ability to delete clips in a sequence, a longer sequence (15 secs) and touch focus it cranks it up a bit. And the timing of the release, shortly after stats showing that the number of Vine posts on Twitter exceeded that of Instagram, couldn’t be sweeter. With the weight of Facebook behind them, Instagram were never going to rest on their laurels so an update was sure to be in the pipeline and with the success that Vine was achieving, it was an obvious model the mirror. Will we see a drop in Vine usage? 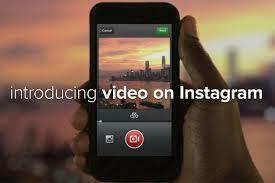 Will Instagram bring a whole new cohort of users to video sharing? Can the two co-exist, with Vine retaining the Twitter community and Instagram remaining in it's own real, where users can share comment etc. without the need to resort to Twitter. Over the course of the last few years that I have been an active Twitter user I've had more than a few discussions with friends and family about its merits, often in response to a comment such as "why would I want to know when you brush your teeth?" or suchlike - to which I've had to extol the virtues of the platform and try and explain that Twitter is what you make of it. You create your own experience based on who you follow and what you say, and it is fast becoming my default choice for killing time and exploring the digital. So what do I use it for? Well, a bit of everything - keeping up with industry news and trends; sharing news and info with friends and family; checking up on news and travel alerts; a bit of inane celebrity watching; keeping an eye on client and competitor activity; and of course smirking at the odd cat gif. As the London 2012 Olympic Games kicks off, we will no doubt see a slew of stats about the amount of tweeting taking place - no doubt surpassing the 15,000+ tweets per second during Spain's Euro 2012 win (there are apparently over 2,000 past/present Olympians that tweet!). You will also be hard pushed to find a digital destination that doesn't support sharing via Twitter, indicative of the fact that it has become the de facto tool for sharing (and discovering) digital content. Of course with any communication medium that has such a large number of users, there is the need to take care. From a Marketer's perspective, things can easily go awry as we often see with poorly considered Facebook campaigns (some good points that reach beyond Facebook in this blog by Carat: http://www.carat.co.uk/blog/five-learnings-from-the-femfresh-facebook-debacle/), and for your average-Joe it has potentially more serious ramifications as the Paul Chambers #twitterjoketrial highlighted. Fortunately common sense prevailed and Paul was acquitted on appeal, but the whole fiasco serves as a very real reminder of the strength, and risks, of such a publicly accessible and 'open' Social Network like Twitter. Twitter's strength is in it's simplicity and the ease with which you can both share and discover. As I said at the start of this blog, you can use it and get out of it what you want. It will no doubt evolve, and I am sure in such a way as to better support an advertising-based revenue model. But I will certainly continue to use it - for enjoyment, information and work - as I am sure many millions and millions of others will too. Why don't mobile browsers recognise a URL? Shamed as I am to look at the last time I wrote a blog post, I thought I'd try and get back in the groove on a topic that's been bugging me for a while. We often talk about how mobile is uniquely positioned as, not just a channel in it's own right, but also as an integrator of channels - able to connect an offline user to a digital destination. I've blogged before about how too much activity that is talked of as "integrated" is often more like "parallel" activity with two activations running at the same time and no real integration. However, using mobile you can engage with a consumer with a poster while they are walking down the high street; from a magazine ad they see when they are on the bus; or with a TV commercial they watch whilst sitting on their sofa, and drive them to a destination where they can get more information, register an interest or even complete a purchase. That is a far more compelling capability than it seems to be based on the prevalence of such calls to action. But there is an issue... There is yet to be smooth and seamless way, a completely intuitive and simple call-to-action, that enables a mobile user to respond and interact. So how do we get users to hit a URL, whether that be to visit a mobisite or download an app, for example? 1. Just show the URL and ask the user to enter it themselves. One benefit of this is that the same CTA can work across desktop and mobile (assuming device redirection is in place). In addition, there is no dilution of the branding on any marketing material - the URL is often included anyway. The downside is that we are asking the user to manually type a URL, beyond the fact that this is not as easy as on a desktop (although not such a chore as it is often portrayed), it is a bit clunky and shouldn't it be easier with a smartphone? 2. Ask the user to "Search". I actually quite like this as a CTA - it's simple and familiar for users and, as with manual entry, is a consistent across desktop and mobile. That said, it forces you to ensure that your SEO is flawless and potentially require you to direct budget at search if you were not already. 3. Include an SMS shortcode/keyword CTA. Familiar for users and requires little effort, with the URL returned via SMS this is clickable and so drives the user to the destination without much fuss. That said, it's generally not liked amongst creatives for aesthetic purposes and, if a brand doesn't already run SMS activity, requires that they get this in place (that's not to say it's difficult or expensive, but it is still a barrier). 4. QR codes (or MS Tags, Shot codes etc. etc.). They have their place, and for some reason some people like them (I received an email with one in recently - ask me about it if you want a 30 min rant on the nonsensical things that some mobile companies get up to). On the plus side, they are the quickest/smoothest way of driving online from ATL. That said, this is only if you know what they are and have a reader app on your device. Oh, and they are also ugly. So the other day it struck me, why do I have to type a URL into my mobile browser? My phone has a camera right? Jeez, my phone can translate text so there's no reason that it couldn't recognise a URL and open the URL. So why haven't Apple or Google added it as a feature to Safari or the Android default browser? Surely they can add a button that activates the camera, recognises the text as a URL (think Google Goggles but within your browser, not a different app), and then opens the page, or even performs a search. I may be being immensely naive but having this capability would mean that both of the routes 1 (URL) and 2 (search) above become much easier. In fact, it means that anywhere a URL may appear, it becomes 'clickable' and a call to action. Doesn't this make "integrated" activity even more feasible? So come on Apple, get a move on Google and pull your finger out Microsoft/Nokia. Why not do this...?